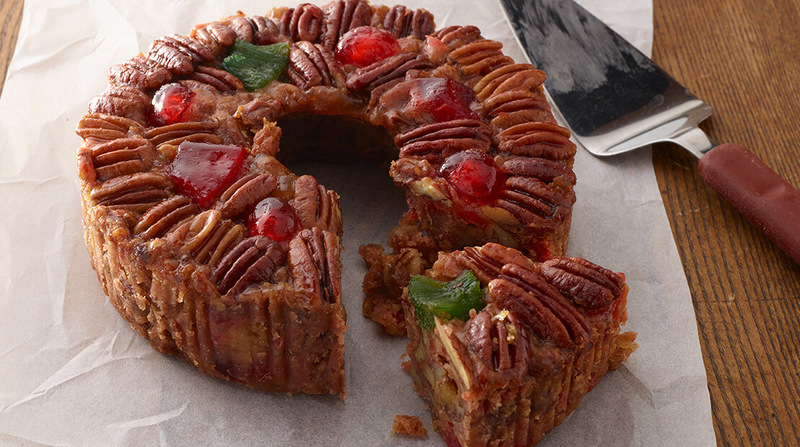 Leave it to Hormel Foods to find a tasty new spin on that holiday staple, the fruitcake. Staff members practically stood in line to work on this project, tasting and judging what’s out there and more to the point, what their company could bring to the table. The end result? You won’t want to miss what we came up with. In fact, you owe it to yourself – and more importantly, to fruitcake. To create a fruitcake that will tease your tastebuds, we started with the classic combination of dried fruits and spices. Then we experimented with crazy flavor combinations. 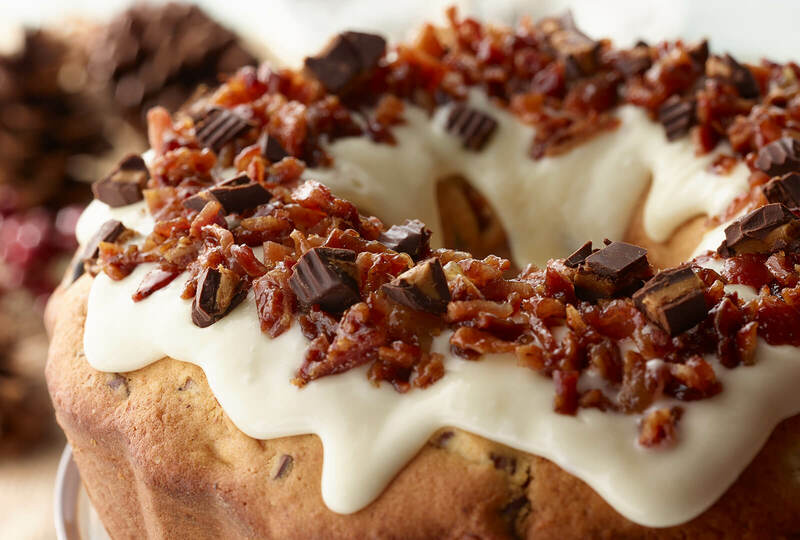 Eventually, we found the perfect balance of sweet and savory with the chocolate peanut buttery goodness of chopped Justin’s® peanut butter cups and candied Black Label® bacon over a cream cheese glaze. In medium bowl, combine raisins and next 6 ingredients; cover and let stand 30 minutes. In mixing bowl of stand mixer, using paddle attachment add butter and beat at medium speed 1 minute. Gradually add sugar and beat until light and fluffy. Add eggs, one at a time, beating after each addition. In medium bowl, combine flour and next 5 ingredients. Add flour mixture to butter mixture alternatively with raisin mixture, starting and ending with flour mixture, just until blended. Stir in chopped peanut butter cups. Transfer mixture to prepared cake pan. It should come as no surprise that fruitcake takes it on the chin in one of the “Vacation” movies. Thanks to Aunt Edna, it wasn’t the first time fruitcake paid a hefty price for a cheap laugh, nor was it the last. But that doesn’t make it right. Maybe it’s just too easy to pile on. The late late-night kingpin Johnny Carson, who is living on in the raft of one-liners and shticks that entertained audiences for 30 years, owes at least a crumb of his immortality to the fruitcake. While America was busting a gut, the people of Claxton, Georgia, otherwise known as the fruitcake capital of the world, were not amused. Two bakeries in town combine to make 4 million pounds of fruitcake every year. Put another way, that’s roughly 1,600 pounds per resident. So, if there really is only one fruitcake, by golly, it’s a big one! It’s a point – if not the point – of pride for the Georgia town. So much so, residents were boning up on their “here’s Johnnys” in the event Carson accepted their say-that-to-our-faces challenge. He never showed. No one ever does, it seems. Just hurl a holiday insult and move on to spring and marshmallow Peeps, all the while singing the praises of virtually every other dessert out there, no matter how fleeting. Yeah, you, cupcakes. Stop pretending to be so sweet and pure. How would you fare after a century of sitting on a shelf? Did any explorer ever take you on an expedition? Robert Falcon Scott made sure to pack fruitcake on his 1910 trek to Antarctica and the South Pole. His leftover power snack was discovered 106 years later, still holding up its end of the bargain by looking and smelling (almost) good enough to eat. And don’t try to hide, butter cookies, so smug and judgy-like. Is there a national Christmas cookie toss? We didn’t think so. But come Jan. 3, head to Manitou Springs, Colorado, anyway. We’ll let you in on the fruitcake action. That is, if you don’t crumble from the pressure. People name their pets and even their children after all manner of foodstuff. Cookie, Muffin, Ginger, Frank, Alfredo – you get the picture. Granted, dubbing your kid Fruitcake would probably close down a number of career paths. (Think neurosurgery, particle physics and rocket science.) But there are plenty of other jobs Fruitcake could do, and do well. Sadly, the name never makes the cut, unless you’re looking to insult someone. The scene in “Remember the Titans” comes to mind, especially because it’s a moment of triumph for our cause celeb. The shame of it is, there are precious few food items more maligned than the holiday fruitcake. Certainly, the culinary world and those of us who dip a toe into its waters now and again have taken a boatload of missteps. Think about the 19th century’s boiled eels and robin pie (yes, the sweet harbinger of spring). I once made a meal where every course contained corn flakes. I’ve mostly lived it down. Maybe because fruitcake always has my back. In this day and age when we all need a hero, are we overlooking the obvious? Has it been sitting in our hall closets all along? Somehow it became part of the traditions of the December holidays, and unequivocally so. When the woman in Truman Capote’s “A Christmas Memory” opens her window and declares, “Oh, my, it’s fruitcake weather,” no explanation is needed. We get it. It’s far from the only time Capote was a brand ambassador for fruitcake. Marie Rudisill, one of the author’s aunts, cashed in on the short-story shout-out by later publishing a book of fruitcake recipes. She’s the same one Jay Leno catapulted to fame as the Fruitcake Lady on his edition of “The Tonight Show,” inviting her to go toe to toe with him and guests Tom Cruise, Cuba Gooding Jr. and others. Like her namesake, she held her own. The nonagenarian was sweet, funny and irascible as all get-out. Laugh all you want. 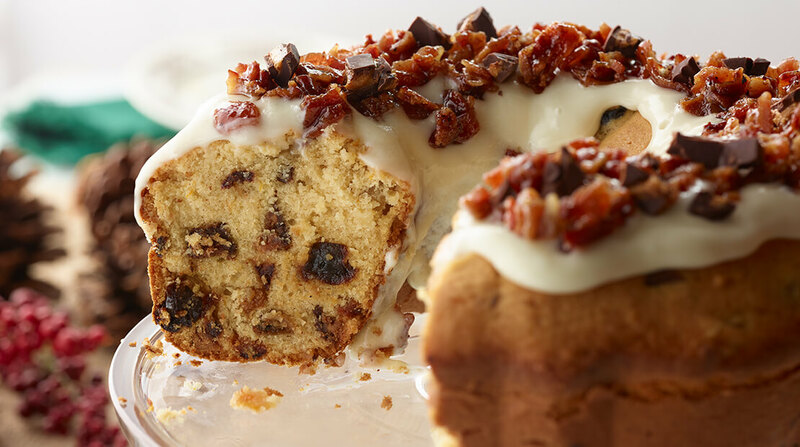 The truth is, we can’t get enough of fruitcake. Few edibles have enjoyed the notoriety and the staying power of that dense, sometimes alcohol-soaked spice cake we love to hate. Perhaps the reasons are more metaphysical than epicurean.